The Val Gardena road system is directly connected to the Brennero motorway (A22). 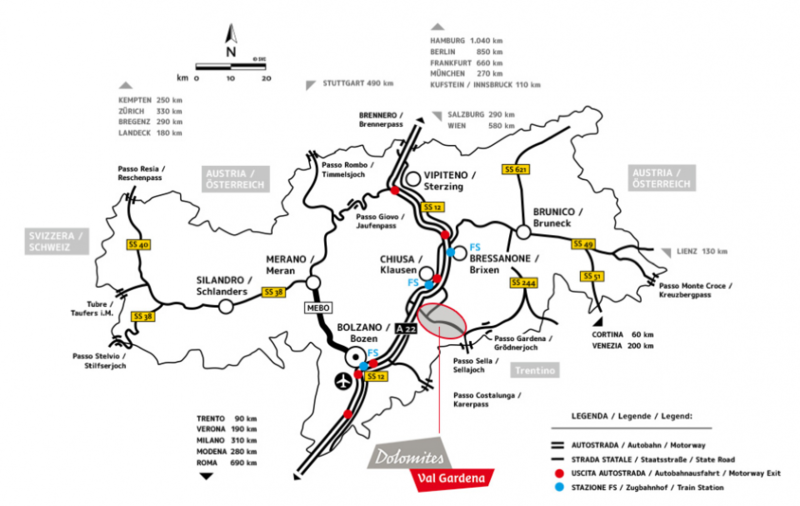 From the south you pass through Verona - Trento - Bolzano and you get to Chiusa; and from the North, take the Innsbruck - Brennero - Chiusa route. The exit "Chiusa - Val Gardena" is indicated here. Following the road signs, in about twenty minutes you will reach Ortisei, further ahead you will come to S. Cristina and then Selva Gardena. The nearest airports are in Verona, Bergamo, Milan, Innsbruck and Munich. Val Gardena is connected to the rest of Italy by IR trains (from Verona and Bologna), IC trains (from Lecce - Pescara - Bologna) and EC trains (from Verona, Bologna and Milan). All long-distance trains stop at Bolzano or Brixen. During the day, there are several buses that leave from Bolzano and Brixen for Val Gardena.